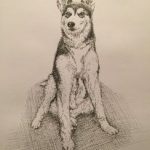 I’ve been drawing quite a lot of dogs recently and I’ve really enjoyed the opportunity to do so. 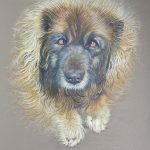 Here is Summer, a beautiful huge Leonberger. 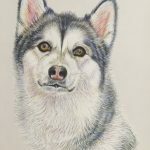 Well, she’s a fully grown lovely Alaskan Malamute now and it was brilliant to draw her again, this time in coloured pencil. But I don’t just want to draw dogs. 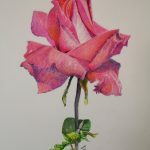 I’ve always had an interest in botanical art, although I think to do “proper” botanical art you need a ruler, a magnifying glass and even a knife to dissect and study the flower parts. It takes years of study to do it properly but, who knows, I might just get hooked. I love flowers though, I particularly love roses and have lots in the garden. My dog Lexi has a tendency to pluck the flower heads off and eat them if I don’t watch her carefully so she loves them too, admittedly in a different way. Even thought it’s November, some of the roses are still flowering and one of them has the most wonderful big blooms which look fantastic against some of the bright and clear blue skies we’ve been getting recently so I’ve been itching to draw one. I didn’t put the blue sky in, it was a toss up but, in the end, I thought the impact I was looking for worked better against the white paper.